When you live in a special place, it is natural to want to share it with others. When that special place offers the charm, history, and value of Margaret Place, it deserves a website! 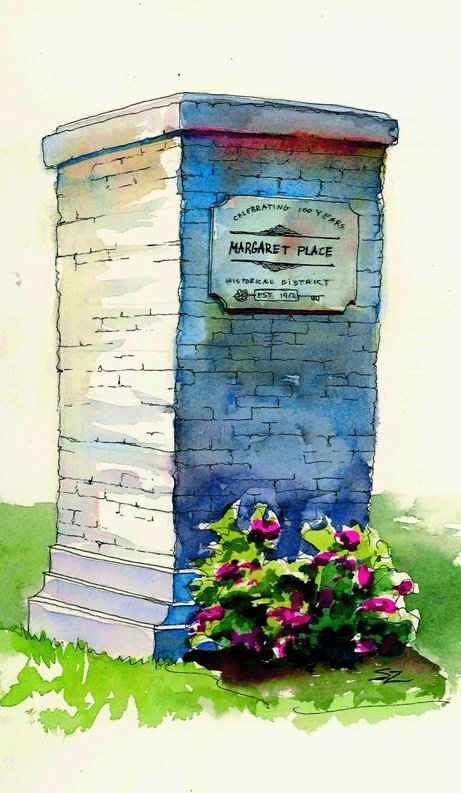 Here, you can learn more about the The History of Margaret Place as well as answer the question, "Who is Margaret, and Why does she have a Place??" Our jewel-box neighborhood is host to 11 Landmark homes. listed on the Calcasieu Historical Preservation Society's (CHPS) Landmark Properties Registry. The CHPS prestigious Landmark Award is a decorative wooden plaque that is usually attached to the front of a structure. Practically every type of Bungalow style is represented in Margaret Place! And, we have numerous Live Oak trees registered with the Live Oak Society. While small in numbers of residential dwellings, we are strong in spirit and volunteerism. The success of the 100th Anniversay Palm Sunday Tour of Homes serves as a testament to our character and talent. And, of course, to CHPS, our partner in that effort. The Palm Sunday Tour and the lengthy list of accomplishments achieved would not be possible without the involvement of our residents and the support and generosity of the members of the Margaret Place Historical District, Inc. a voluntary, membership based organization. There are two membership categories: Voting: owners of property within the district with dues of $100 per year. Non voting: Renters and Friends of Margaret Place, $50 per year.